You know those days when you need to make an easy meal for a group, maybe it’s your Bible study group or friends to watch a game… those days when you want to just throw something in your crock pot and walk away. Those days are PERFECT for Taco Soup. Throw it all in the crock pot. Stir. Turn it on low. Walk away for about two hours. Alternately, you can put it in a pot on the stove and bring it to a boil. Reduce heat and simmer about 30 minutes. Serve with shredded cheese, sour cream, and chips. I prefer Fritos, but then I LOVE Fritos. A couple hints about making taco soup. You can throw frozen cooked ground beef in the crock pot with the other ingredients. Then just stir it a couple times as it cooks. So, that extra beef you cooked up the other day… Grab it and go! Taco Soup freezes REALLY well. You can make this a vegetarian meal by taking out the beef (duh) and adding in some additional beans like kidney beans and black beans. Mmmmm… beans. When you buy the ingredients for this meal, buy double the cans. You’re going to be making it again… and soon. 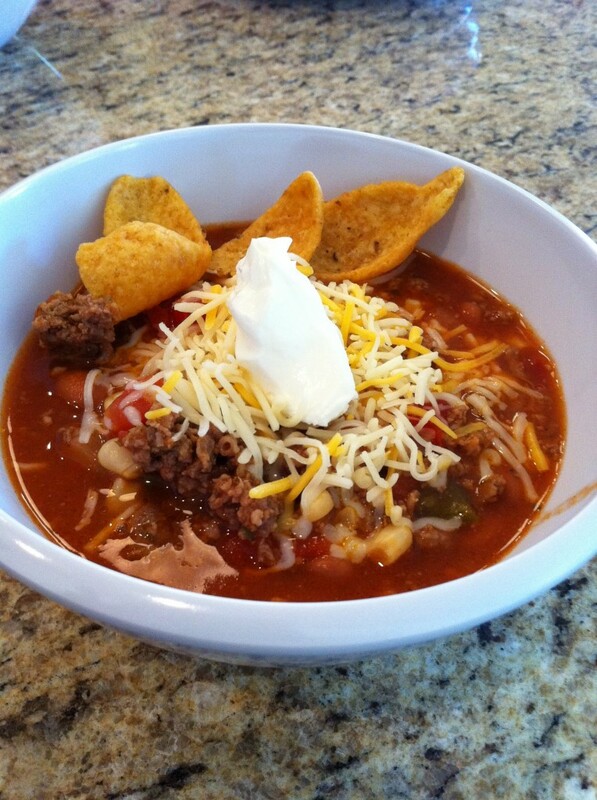 Do you have a variation of taco soup that you like to make? Do you have another favorite soup? This entry was posted in Cooking, Recipe by KHill. Bookmark the permalink.